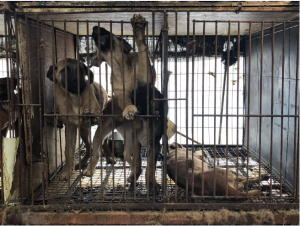 Pohang, South Korea, Shut down the illegal dog meat farms, slaughterhouses and markets. Home / Blog / Pohang, South Korea, Shut down the illegal dog meat farms, slaughterhouses and markets. In Pohang, there are countless dog farms, slaughterhouses, markets and restaurants where the dogs, who are tortured their entire lives, end up being slaughtered in the most inhumane ways, such as by electrocution, hanging or beating; and then thrown into boiling water – sometimes while they are still alive. In many places, dogs are being killed in full view of other terrified, caged dogs; and this takes place in broad daylight. In addition, many abandoned and stolen former pets end up in this industry, and are subjected to the same cruelty. The searches resulted in: 117 Health Food Shops; and 73 dog meat restaurants in and around Pohang. Even if half of these ‘Health’ Food Shops and restaurants serve dog and cat ‘ingredients’ in one form or another, just imagine how many dog/cat slaughterhouses must be present in and around Pohang in order to supply all of these outlets. Please sign petition, call, write and email the Pohang Mayor and the City Council TODAY! Subject: Pohang, South Korea, Shut down the illegal dog meat farms, slaughterhouses and markets. Petition: Pohang, South Korea, Shut down the illegal dog meat farms, slaughterhouses and markets. I have had nightmares over this for years! I remember watching 20/20, 20 years ago and it was about the dog meat industry . It showed a man who had friended a Sherman Shepherd dog. Overtime, the dog gains a trust when suddenly, the man starts knifing the dog in the leg artery! The dog is confused because it trusts the man and the dog actually goes towards the man for help and gets sliced again! 20 years ago! I can’t get that out of my head but the internet has brought more horrific videos and pictures exposing these images before our eyes and embedded in our memories forever! It has to stop! disgusting and illegal! STOP the depraved abuse to & sadistic torture of innocent, vulnerable, dogs & cats WHO, by the way, are always at the mercy of humans — your acts are immoral & brutally criminal — a respectable, respectful, moral, rational, sane, compassionate society would NEVER allow monsters anywhere near animals — this needless “meat racket” MUST be abolished & destroyed permanently — with so much food available, WHO in their right mind would purchase dog & cat products! — SHUT DOWN THESE UNCONSCIONABLE, CRUEL, depravedly sadistic, DOG & CAT MEAT FARMS once and for all.